There are many styles of kitchen knives available. However, which knives can be used with a particular sharpener? What is all this 15, 25-degree angle business? In our next few article posts, we will attempts to explain all of this and more. First, let us look at the various styles of knife that you will find in today’s kitchen. The almighty chef’s knife, you will almost certainly have one these at home. Very versatile, a chef’s knife can be used for everything from chopping meats to slicing fruits and vegetables. Apart from the cleaver of carving knife, a chef’s knife is the largest knife in the kitchen. It is certainly the most used. The broad blade generally ranges from around 8” to 10” inches in length. Helpfully, the tip of a chef’s knife curve upwards, this it to aid the rocking motion used for fine mincing. To give extra weight and strength, the spine of the blade is thick and robust. Many chef’s knives have a bolster, or metal collar, between the blade and handle, which helps prevent the knife from slipping. Paring knives are usually 2-1/2-4″ in length. There are several kinds of paring knives available. This is ideal for intricate work such as peeling the edges of fruit and vegetables. They can also be used for precise cutting and fluting. This straight edged knife also works well for peeling and preparing food. Ideal for cutting skins with a soft inside, such as tomatoes. This type of knife features a curved blade with a raised point, and is used for removing items such as pit from olives, or eyes off potatoes. Utility knives are mid-sized knives and are generally used for miscellaneous cutting. They are sometimes called sandwich knives due to being the ideal tool for slicing meats and cheeses. The blade of a utility knife is usually between 4 to 7 inches long, making the knife larger than a paring knife but not as larger as a chef’s knife. The blade can be either straight edged or serrated. A boning knife should not be confused with a steak knife or a fillet knife. In order to cut around the bone, a boning knife has a more flexible blade that is normally around 4 to 5” long. Used precisely how it is described, the knife is ideal for removing meat from the bones of fish, red meat or poultry. For use with ribs and chops, a narrow boning knife is best suited. Chicken and pork should be cut with a medium boning knife. A curved boning knife is best used when working the angle close to the bone. The bread knife usually has a serrated edge. We would recommend a serrated knife with pointed serrations (rather than wavy) for better control, cut and longevity. Bread knives come in a range of sizes between the smaller 6” blade, (ideal for cutting buns and small baps) and larger 10” blades for cutting loaves of bread. As with all types of serrated knife, they should be operated in a sawing motion rather than normal slicing. 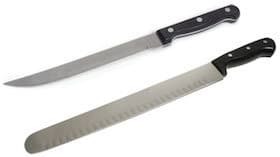 The serrations on a bread knife are designed to cut through the crusty exterior and are therefore very deep. This makes them unsuitable for cutting vegetables or fruit. For slicing meat, the best tool to use is a carving knife. Fitted with long blades, a carving knife allows for cleaner cuts that other types of knives. Carving knives range from between 8 and 14 inches long. Carvers are also bulky, the additional weight used to help cut through tough meats. Chinese cleavers have wide-blades and narrow-spines, and are ideally suited to chopping through meat and vegetables. They can also be used to remove meat from bones, tenderizing meat and for crushing foods such as garlic. 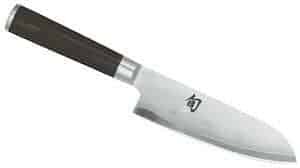 The Santoku knife is a Japanese kitchen knife and is the asian version of the chef’s knife. Like a Western chef’s knife, the Santoku is mostly used for chopping vegetables; with the wide blade being ideal for scooping sliced food off a cutting board. The knife can also be used for slicing meat, and can make very fine cuts due to its thin spine. Santoku knives have curved blades that help the user apply the rocking motion used for chopping food. The type of material a knife is made from is an important factor that will determine its quality. High carbon stainless steel knives are generally the most expensive and you will find that they will last longer. They do not stain and the edges will hold sharp for longer than other types of knives such as steel. Ceramic knives can stay sharp for a very long time, and should only be sharpened by a professional when maintenance is required. You should also only ever use a ceramic knife on a cutting board. Do not use on another ceramic, plastic or glass surface as you will damage them. An article exploring the difference between these two style of knives, and the approach to sharpening them is covered here.